As SAP customers are advancing their landscape towards BW/4HANA they will have to transition from their traditional BEx Reporting to the latest SAP Analytics offerings. In this blog I would like to highlight one such scenario where the BEx Workbooks would be replaced by SAP Business Objects Analysis for Microsoft Office (referred as AO). One of the biggest hurdles most customer face today is to Migrate/Convert thousands of BEx workbook to Analysis for office. 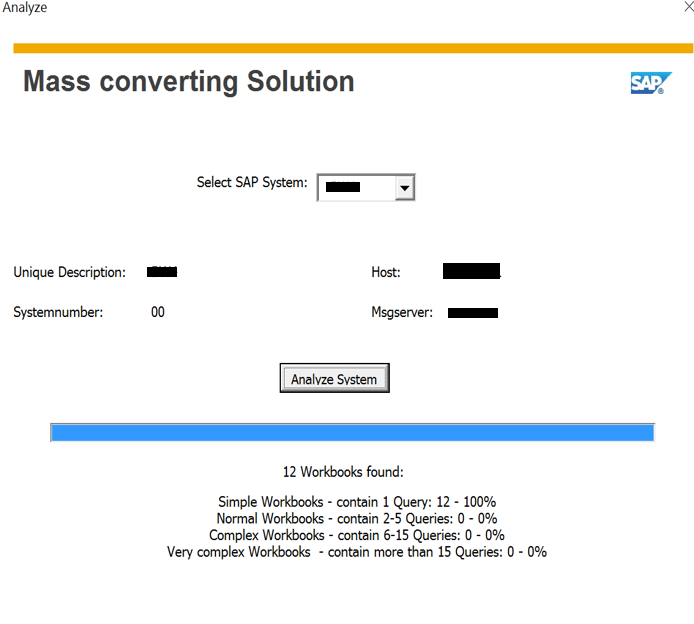 In the current state of things BEx workbooks has to be converted Manually one workbook after other from Analysis office as there is no Automated Mass conversion utility available. This challenge provided us with an opportunity to build a utility/service which can help our customers to easily Migrate/Convert their BEx workbook to AO workbooks. We have enhanced the old version of the tool which was presented in https://blogs.sap.com/2014/05/21/migrationservice/ to latest version which can now convert the workbook to AO 2.x. We have a special install of analysis for office along with our code which will facilitate the conversion. this options will be integrated to the AO ribbon. a. Options to save to different role. b. Options to use prefix and suffix. In the current version we only support save to NW platform, we are working on “Save to BI Platform” and will update the blog accordingly. some of the limitation which are still being worked. Item: List of Exceptions The list is not converted. The exceptions are available as Conditional Formatting in Analysis and can be activated and deactivated with the menu. VBA API Customer-specific code is not converted, but it is available in the workbook after the conversion. Navigation Pane No conversion. You can use the design panel in Analysis. Item: Dropdown Box (displaying query views) No conversion. Hopefully this will help our customer to move their BEx workbooks to AO faster and with very less effort. Can you please provide an approx timeline when we can expect the feature to save to BO platform in this tool? If we are moving to AO , we would like to move to BO platform as this is the strategic direction from SAP. Yes Save to BI Platform will be a important feature. unfortunately i don’t have a set timeline currently as it has several dependency. Tentatively this should be available early September but this can change. I’ll update the blog as soon as i get more information regarding the same. Thanks for this post. This is very informative. Do we need to buy this migration tool or it can be downloaded for free. We are planning to do a demo to show it to our partner. Can we have temporary access to the tool? Please advise. Thanks for your interest. This is a combination of custom AO install along with our coding which is not available as a standard install. Unfortunately this is not available for download or buy, you will need to Engage SAP where we offer this as a Migration service. 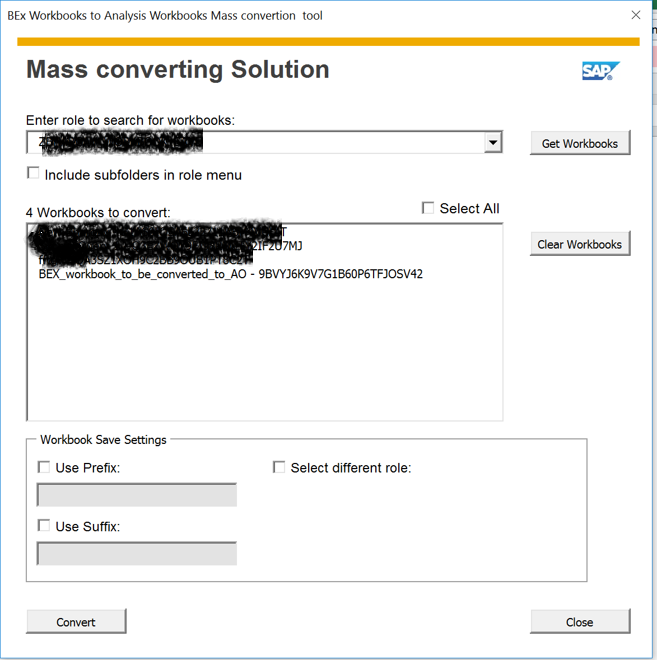 I need the tool for mass converting AO workbooks saved to NW to AO workbooks saved to BI Platform (using BICS/OLAP connection defined in BI Platform). In that case the key is source (connection) conversion from NW to BIP OLAP connection. Have you something like that? This is currently being developed… will update the post once completed. We also need to migrate BEX to AO work books. Whom should we contact in SAP to get this migration code to do mass migration? Please contact your SAP Premium Engagement contacts or ask Account to team to reach out to the global contact mentioned in the blog. Thanks for this blog. Will this tool also work for Remote Conversion ? ( if BEx workbooks have to be converted to AFO 2.0 using Remote Conversion). Can you us please give more details to address this query? What is the expectation? What do you mean by remote conversion? We are also in the process of identifying the Bex workbooks for migration and availability of “Save to BI Platform” will helps us a lot. Is there an update on when this will be available. Yes it supports save to BI Platform but in current version the connection points to BW GUI connection, pointing to BI platform OLAP connections is not complete. We are dealing with the procedure to get this service offering from our SAP Engagement. Could you let me know if there is a minimum BW version required to process this mass migration to AFO (we are in 7.01 SP15) ?